Paav Bhaji is a very popular western Indian street food where 'Paav' means bread and 'Bhaji' means vegetables. Boil and grate potatoes. Steam chopped carrots and beans. Chop bell peppers, green chillies, ginger, onions and tomatoes. ** Butter: the more the better. I personally don't add just 2 tbsp. It is often said that the bhaji tastes better with Amul butter [Indian brand butter].....and this reminds me of wonderful Amul hoardings in my city which I grew up gazing them on my way to school...I searched for few online and wanted to share with all of you ..
Oh, these buns with spicy mixed veggies look amazingly delicious! All time favorite food, looks delicious. All time fav food. Looks yummy. Its light & yet tasty chat. 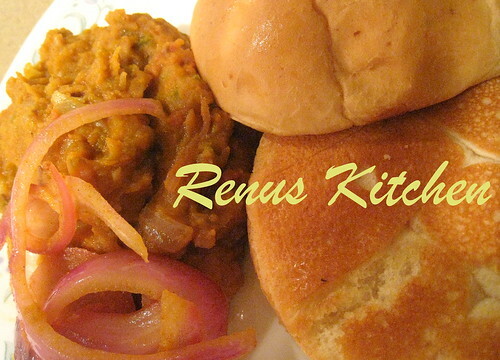 I m always game for Spicy bhaji with hot buttery buns...simply mouthwatering. I stumbled across your blog purely by chance but am glad I did, your dish looks absolutely delicious. It is an amazing recipe, the contrasts in the ingredients and flavor that is ... yummy ... my family loved it!